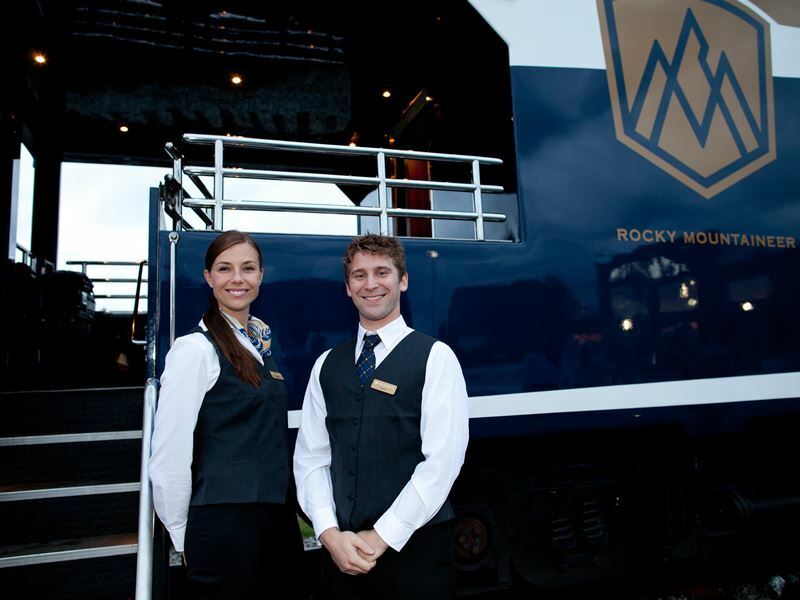 As soon as you arrive at the Rocky Mountaineer departure station you’ll feel a wave of excitement. Happy, smiling groups of travellers are welcomed by equally as excitable hosts. In the corner, a pianist adds to the cheery atmosphere with a tune from his grand piano. Meanwhile, everyone checks in their bags and a gaggle of enthusiastic voices fill the room. After a quick welcome speech, you’ll be whisked on to the platform, where many eagerly grab their cameras to get a photo of the beautiful train, and staff wave flags and help people onto their carriage. Settling in to your large, comfy seat, soon the train will pull away from the station as staff wave and cheer, setting you off on your journey of discovery and luxury. 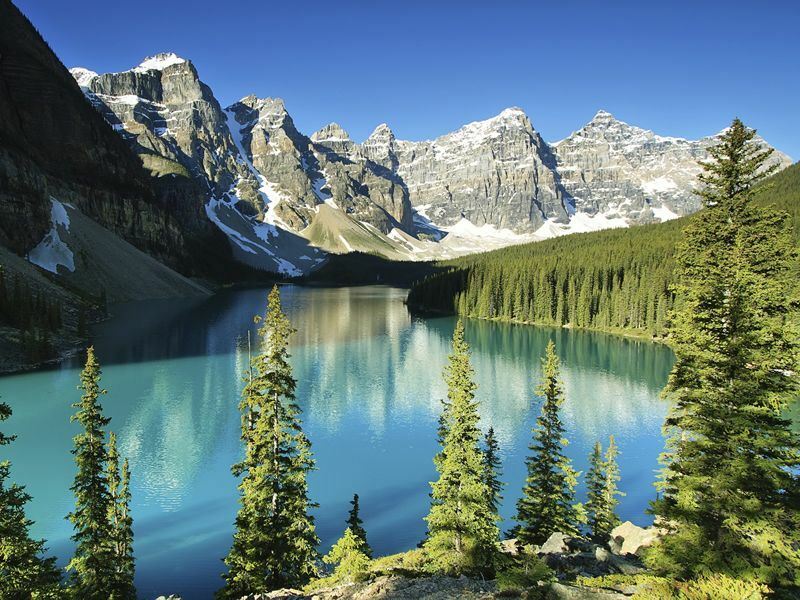 Rocky Mountaineer, the world’s largest privately owned luxury tourist train, offers a truly lavish way to discover Canada’s natural beauty. Having welcomed nearly two million guests, there’s no surprise that this is a very popular affair, providing only the utmost luxury as you journey past stunning landscapes and stay in opulent hotels. 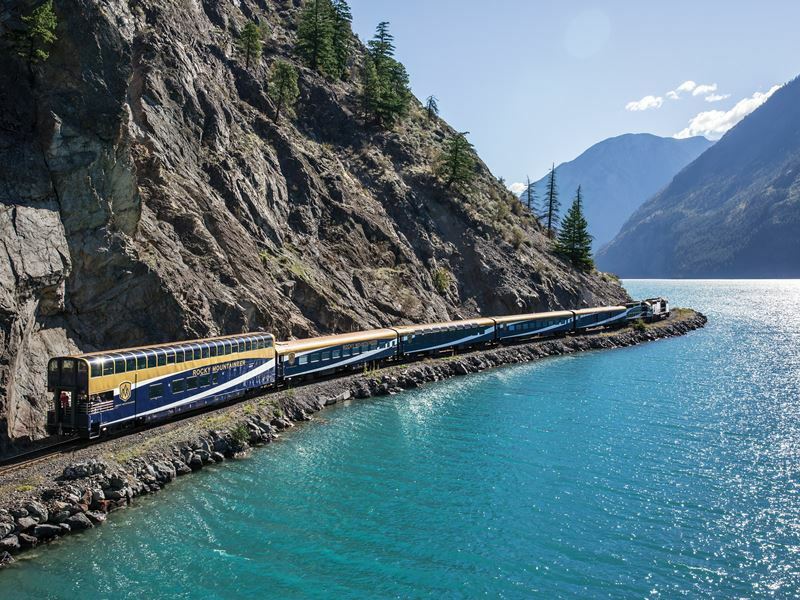 Running from April to mid-October, there are so many reasons why a journey on board the Rocky Mountaineer is an experience you won’t want to miss. From the gourmet food and unforgettable views, to the sociable hosts that go the extra mile, here’s what to expect should you embark on the Rocky Mountaineer. With two services to choose from, it’s your choice whether you’d prefer perfect, or more-than-perfect. Both services, SilverLeaf and GoldLeaf, are well worth enjoying, but the GoldLeaf Service adds just a little more je ne sais quoi. The SilverLeaf Service consists of single-level carriages with oversized dome windows, with gourmet hot entrée options bought to your huge, comfy seat – it’s like eating breakfast and lunch in bed. All drinks and snacks are complimentary, so you’ll never go hungry, and there’ll be two friendly hosts on your carriage to cater to your every whim, as well as offering some funny and heart-warming commentary. Meanwhile, the GoldLeaf Service has two level carriages. The top level has fully domed windows offering a panoramic view of the world outside and comfortable seating, whilst downstairs has a gorgeous dining area with large picture windows, ideal for dining on sumptuous, gourmet a la carte meals. The three to four hosts will ensure your glass is always topped up, and our favourite part has to be the open-air vestibule, ideal for getting a one-of-a-kind glimpse of the passing landscapes. With four main routes and over 65 holiday packages, Rocky Mountaineer opens up a whole new world full of natural wonders usually unseen by those travelling on foot or by car. Travelling in the daylight, you’ll have picture-perfect views no matter which route you decide to embark on, and then in the evenings you’ll be transferred to a lavish hotel where your luggage will already be waiting for you. Bliss. 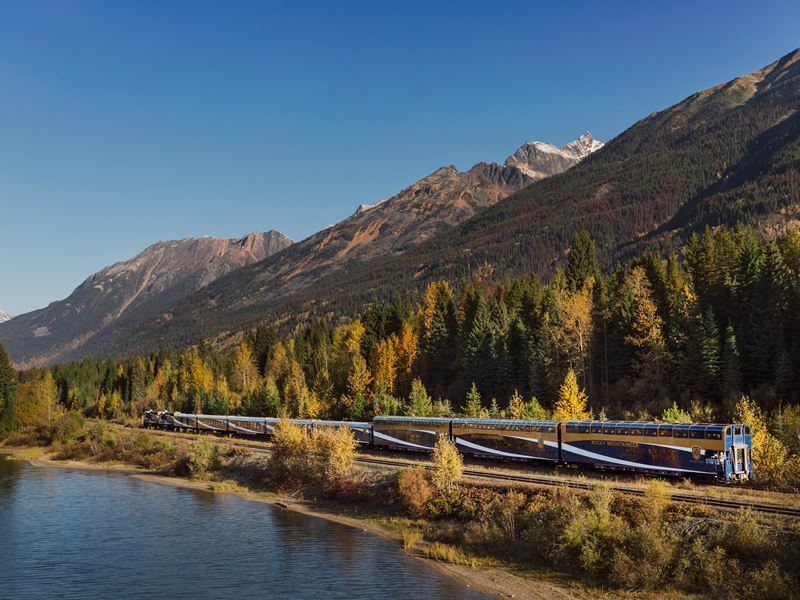 Hop on board the Rocky Mountaineer at a range of departure and arrival locations, including Banff, Calgary, Jasper, Lake Louise, Seattle and Vancouver. Check-in and check-out is even easier than at an airport, and there’ll be plenty of friendly, smiling faces ready to help you and welcome you with open arms. You’ll even find a grand piano at some of the stations, and your train will depart with happy waves from the station staff. The overnight stays are located in a few destinations, including the sunshine-enthused Kamloops, ideal for hiking and sipping on chilled Pinot Gris, and the charming Quesnel abundant in deer that make the picturesque Riverfront Trail System their home. Whistler is also a key overnight stop, offering the wonderful Peak 2 Peak gondola ride and plenty of outdoor recreation, or you can choose to stay in Banff, Calgary, Jasper, Lake Louise, Victoria, and Vancouver. The hotels and room types vary depending on which service you’ve chosen. The SilverLeaf Service offers a myriad of luxurious hotels perfect for unwinding, all with on-site or nearby restaurants, whilst the GoldLeaf Service brings it up a notch with truly opulent properties and premium room categories. Fancy really indulging? Pick the Deluxe GoldLeaf package and you’ll be upgraded to the finest accommodation around, staying in the highest room category possible. There are four main routes to choose from: First Passage to the West, Journey through the Clouds, Coastal Passage, and the three-day Rainforest to Gold Rush route. Each have their own enticements, from soaring mountain ranges and sparkling coastlines, to verdant rainforests and historical towns, and you can even enjoy a package that includes more than one main route. With over 65 packages, you’ll be spoilt for choice, all combining a Rocky Mountaineer journey with a self-drive, escorted tour, or even a luxury cruise. 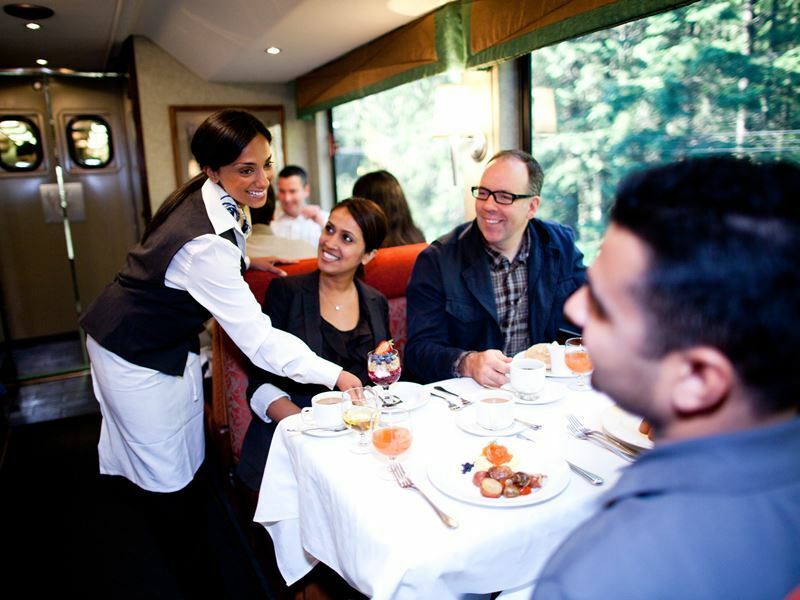 A trip on the Rocky Mountaineer is a culinary adventure too, taking you on a foodie journey inspired by the landscapes outside your window. Each dish features local ingredients cooked in innovative ways, all created by award-winning chefs Jean Pierre Guerin and Frédéric Couton, and all dished up with a sensational glass of Okanagan wine. Should you embark on a SilverLeaf journey, your breakfast and lunch will be served to you in your seat, leaving you to comfortably tuck in and keep an eye out for moose and grizzlies along the horizon. Breakfast begins with a sticky cinnamon scone and fresh fruit salad, before a delicious three cheese omelette with skillet potatoes and chicken sausages. Lunch is a sumptuous three-course affair, with a great choice between freshly grilled salmon and braised short ribs. Delicious! The GoldLeaf Service’s lower dining area feels even more luxurious, creating a fine-dining vibe and ample opportunity to meet other diners. The menus are much more varied too, with breakfast consisting of a flavoursome choice between caramelised sourdough flapjacks, Canadian cheddar soufflé, eggs benedict, and cranberry apple French toast. Lunch is even more decadent, beginning with a daily soup or salad, then presenting you with the difficult choice between Fraser valley chicken, seared tuna steaks, and slow roasted pork loin. 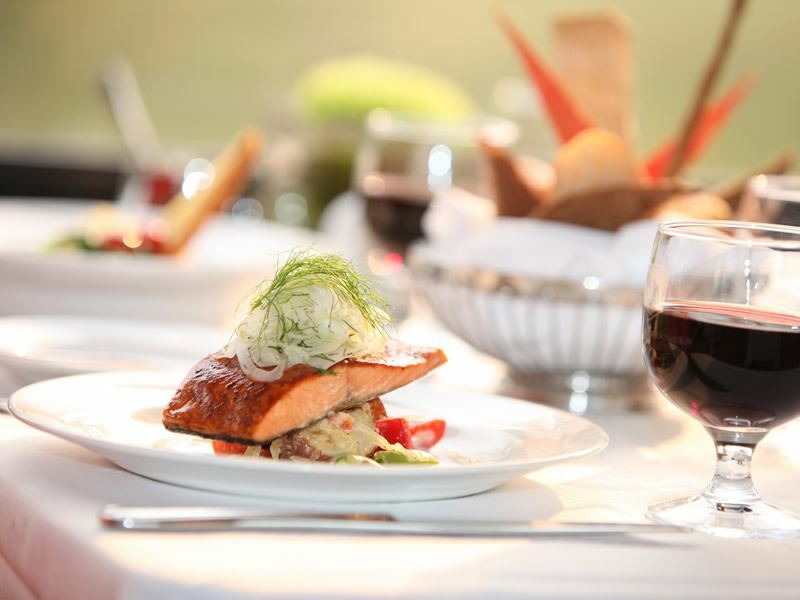 Either way, Rocky Mountaineer’s gourmet cuisine is sure to tantalise your taste buds, and take you on a delicious journey you won’t forget in a hurry. 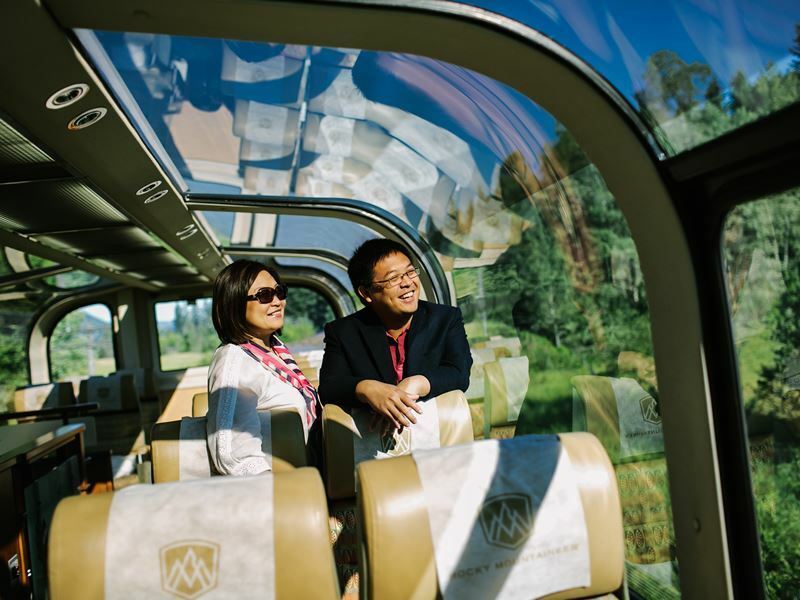 With spectacular views and delicious food, the Rocky Mountaineer is already a dream – but the friendly train hosts are one of the main reasons why a trip on this luxury train is so memorable. As soon as you step on the train you’ll be greeted with the widest of smiles, your train hosts catering to your every need every second of the trip. Need a top-up of your drink? They’ll be filling it up before you even ask. Hoping to spot a prowling bear? Let them know and they’ll endeavour to point them out to you. They truly go above and beyond to make you feel at home, and make your trip a once-in-a-lifetime experience. They have plenty of stories to tell, too. From stories that will tug on the heart strings, to tales that will make you gasp in terror or shriek with laughter, the soundtrack to your journey will be the host’s plethora of anecdotes, all showing off the beauty and history of Canada. 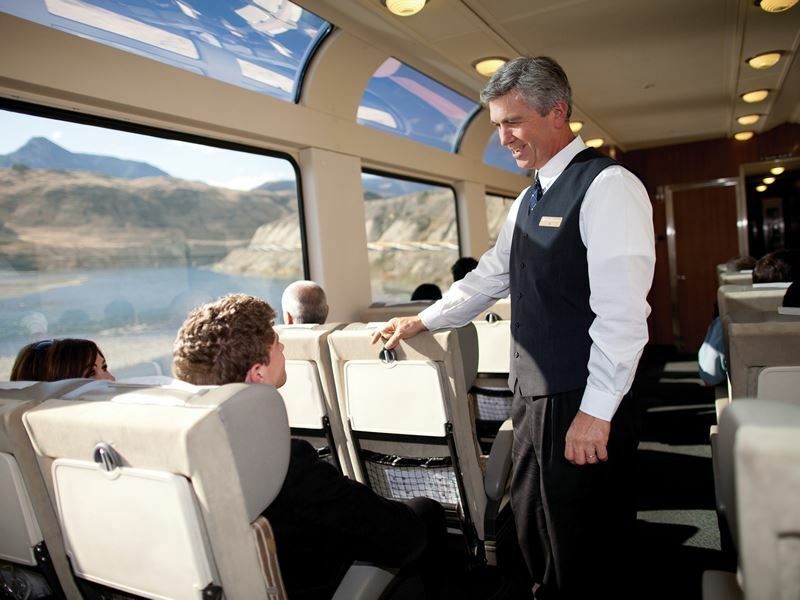 Overall, Rocky Mountaineer’s staff truly go the extra mile for everyone who steps on board, and we have no doubt that you’ll create firm friendships during your journey.